The holiday season is a great time to catch up with family and friends, eat a lot of delicious food and watch all the TV shows you missed in 2018. Television continues to bring forward new and exciting stories, and 2018 was a big year for quality shows. The industry is pushing boundaries in areas the film industry has long neglected. Writers are finding ways to represent LGTBQ voices, more female-centric stories and sharing social issues that need more visibility. It’s made binge-watching TV an absolute pleasure and also a great way to pass the time during those cold winter days. We’ve assembled nine shows that cover all of these bases and showcase not only great writing, but stellar performances. There’s something for everyone on this list, from drama to comedy to a spectacular musical. GLOW is based on the real-life story of the Gorgeous Ladies of Wrestling, which was not only a live event, but a syndicated TV show in the 1980s. While the Netflix show takes a few liberties on the true story, it also tackles the racist characters the women played, the glass ceilings the original cast broke and the sexist stereotypes they had to face. After you watch the first two seasons, don’t miss the 2012 documentary about the women — GLOW: The Story of the Gorgeous Ladies of Wrestling on Netflix. This will have you all caught up and ready for season three, which will return to Netflix in 2019. This FX series from Ryan Murphy really opened up a whole new world for transgender actors in the entertainment industry. There are over 50 transgender characters in the series, with the largest assembled cast of transgender actors for a scripted show. The series explores the downtown New York City ball culture in the 1980s, where the Latinx and Black culture ball scene is juxtaposed by the rise of the yuppies and shadowed by the AIDS crisis. It’s a fascinating look at dance, the structure of families in the ball world and the struggles of the transgender community. After you watch the eight episodes of season one of Pose, dive into the 1990 documentary Paris Is Burning for an even deeper dive into the ball world. We should only have to say, “Sandra Oh,” to make you watch Killing Eve. Her consistently excellent work is on display in this BBC America show about an MI5 officer chasing down an assassin, played by Jodie Comer. The cat-and-mouse game becomes an obsession for both women. It’s honestly a show that should be at the top of your binge list this holiday season, and it will demonstrate why Oh earned that Emmy nomination this year. Don’t worry; season two is coming your way in 2019. For lighter and more comedic fare, try NBC’s The Good Place, available to watch on Hulu. There are three seasons for you to enjoy this colorful, hilarious and absurd world. Kristen Bell and Ted Danson head up an ensemble cast of quirky characters in a show in which Bell’s character finds herself sent to the wrong place in the afterlife. There is a major plot twist between season one and season two, so don’t jump into season three without setting yourself up with the prior seasons. 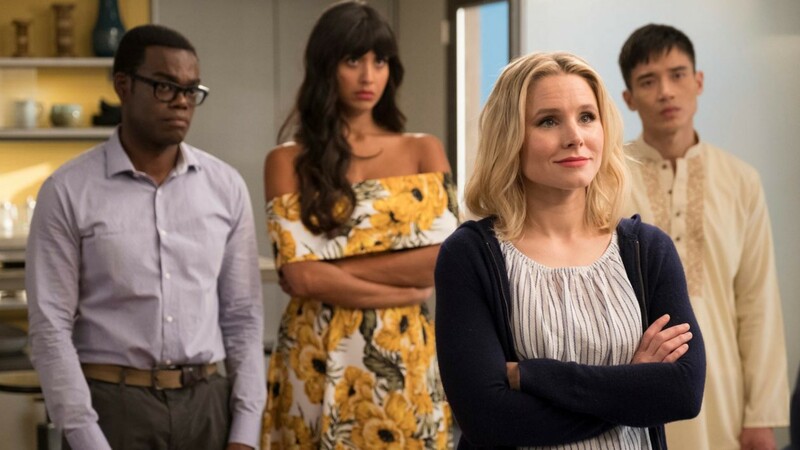 The Good Place is one of the best shows on TV, so make sure you are “forking” watching it. This eight-episode Netflix documentary will show you the rise and fall of Flint, Michigan. Flint Town will make you mad that American citizens have to live in a state of crisis every day of their lives. The city deals with everything from a water crisis to living in extreme poverty told from the point of view of the town’s police department. How do they all join together to save Flint, Michigan? Can it even be saved? For some, the holidays means cramming together in close quarters with friends and family for the winter and hanging out — with mixed results. That kind of uncomfortable familiarity is ever-present in HBO’s Camping, starring Jennifer Garner and adapted by Jenni Konner and Lena Dunham (of Girls renown) from the original U.K. series of the same name. Currently available to watch on HBO Go, Camping follows four couples who gather at a California campground to celebrate one friend’s 45th birthday. With buried secrets coming to light, a unexpected guest showing up and ruffling feathers and one very tightly wound friend trying to control the weekend festivities, Camping is as hilarious as it is awkward — and, because it clocks in at eight half-hour episodes, it’s very bingeable. The tabloid frenzy that ensued around Gianni Versace’s murder is captured in this nine-episode FX series. While the Versace family released a statement saying the series “should only be considered as a work of fiction,” the anthology gives a solid slice of how this tragic event unfolded. This improbable real-life story from 1997 was tackled this year by Ryan Murphy. It drew out incredible performances by Darren Criss, Lady Gaga and Ricky Martin and earned Criss his first Emmy for his portrayal of serial killer Andrew Cunanan. This black comedy takes a mediocre hit man and places him in Hollywood, where he tries to realize his acting dreams. This wacky premise makes for an incredible HBO series. Both Bill Hader and Henry Winkler won Emmys for their performances in Barry, which should be reason enough to watch, but also, it’s genuinely funny in the wriest of ways. Queer Eye for the Straight Guy is back, but this time, it’s on Netflix instead of Bravo, the name has been shortened to just Queer Eye, and the new Fab Five is taking on Atlanta instead of New York City. As the trailer states, “The original show was fighting for tolerance, our fight is for acceptance.” By tackling a more conservative area of the country, the Fab Five hit on some hard topics, from religion to mental health to prejudices within the LGBTQ community in the first two seasons. It’s hard to watch this series without a tissue box nearby. The bridging of differences is a big part of why you should watch Queer Eye. What show will you be binge-watching over the holiday season?